Wow. I’m still trying to figure out how to process this one. 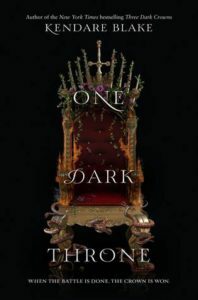 One Dark Throne picks up right where Three Dark Crowns left off. Beltane is over and the three Queens have now entered their Ascension year where only one can be victorious. 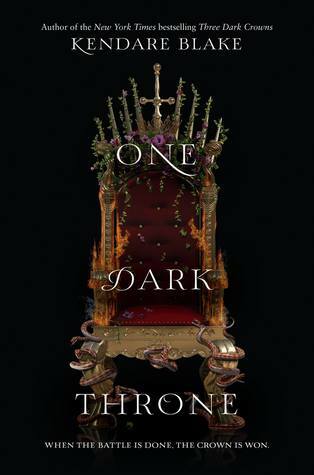 Betrayals, alliances, and heartaches abound in this next installment where each of the three queens must decide her own destiny. For the sake of the Island and their own lives. So I read these two books back to back and I don’t know if that influenced my thoughts on this one or not, but I’m having trouble trying to figure out how to rate this one. There are parts of it I absolutely loved and there are parts of it I couldn’t stand. Things that I didn’t like in Three Dark Crowns carried over into One Dark Throne. The main pet peeve being PEOPLE DIDN’T COMMUNICATE WITH ONE ANOTHER and we all know how I feel about that. I did love seeing the Queens make their own decisions in this one though. Not that they didn’t in the last, but in One Dark Throne they’ve really come into their own and refuse to simply be puppets for their respected regions. I think Arisnoe has come to be my favorite with her no nonsense attitude and straight forwardness. Mirabella is also easy to like with her compassion, but Katherine is by far the most interesting with the shift in her story arc. I’m dying to know more. Besides the communication thing, I think the other issue I have with this series is it changes POV so often that you have trouble keeping up and being invested in the characters. I mean, you might be drawn to certain ones based on your own personal preferences, but I didn’t finish these books with a clear idea of who I was rooting for. Naturally, this is not a requirement in a novel, but it kinda made me feel a bit detached and less invested in the overall outcome. I DO love how dark this series gets. Kendare Blake is not afraid to go there and I LOVE that. The plot moved rather quickly with twists and betrayals abounding. Some you definitely saw coming, others not so much. I’m interested to see where this story goes especially after this ending THAT COMPLETELY RIPPED YOUR HEART OUT. Kendare Blake definitely set us up for one hell of a grave noir! Overall though, I really enjoyed it. I’ll be picking up the last installment when it comes out and if you’re looking for some dark, twisted fantasy this is the series/book for you!